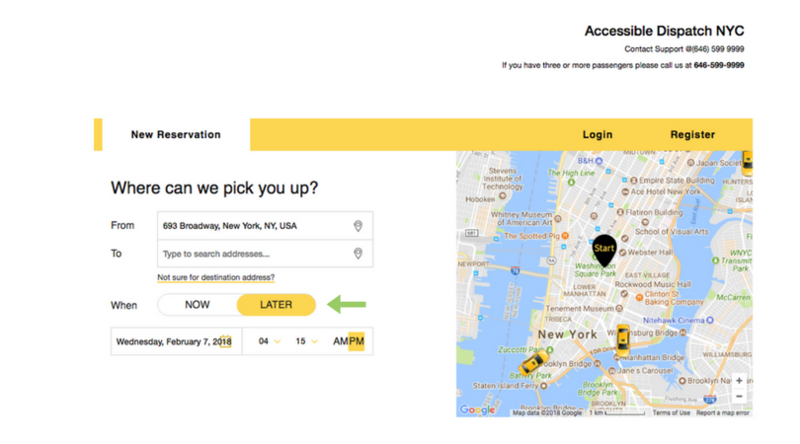 Did you know that booking your reservation in advance for outer borough pick-ups helps ensure shorter wait times and a more convenient trip experience? Booking your trip in advance will give your driver enough time to reach your location at the scheduled pick-up time. With Accessible Dispatch you can either book your ride when you need it using the mobile app, or call our dispatch center directly at (646) 599-9999 up to 24 hours in advance to reserve your vehicle. Maybe you ordered your vehicle too soon, or maybe your driver arrived faster than expected. Either way, it’s always best to be ready for your trip before requesting a ride. We’re human, so we all make mistakes. It may be as simple as typing one wrong number for your address or not carrying out the due diligence of typing out avenue vs. street. Don’t rely on the location feature. Instead, enter the address, type in a business name or move the pin yourself. Many drivers play music for you, the passenger — not themselves. So, if you’re not into the music or you would just prefer some quiet, don’t hesitate to ask to turn it off or change the station. On the other hand, if the driver picks you up, has nothing playing on the radio and the silence is awkward for you, simply ask him/her to turn on some music or your favorite station. Just ask politely.